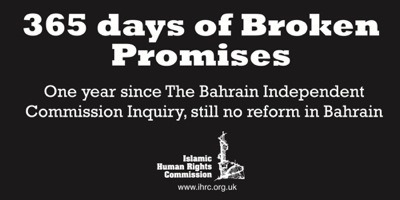 It has been one year since the Bahraini Independent Commission of Inquiry report but there is still no change in the situation. Activists are still being imprisoned, targeted and tortured. IHRC is organising a press conference that will bring together key human rights and activist groups that oppose the actions of the Bahraini regime and want to highlight the repression that still continues despite the rhetoric that the regime has come out with. Despite the words of the King, there has been very little change. This month saw 30 Bahrainis stripped of their nationalities for opposing the actions of the regime; silencing opposition voices is not the way to bring about reform. IHRC will discuss the failures of the Bahraini regime at the Press conference chaired by Lord Nazir Ahmed.